NEW YORK (JTA) – To frack or not to frack? 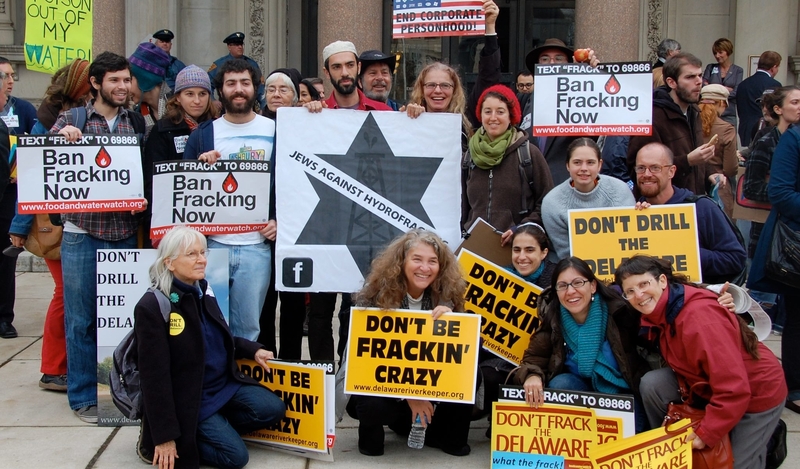 As concerns mount over the environmental and public health consequences of hydraulic fracturing, known as fracking, Jewish groups are coalescing around a strategy that supports efforts to extract natural gas from shale rock while seeking to mitigate its worst effects. In May, the Jewish Council for Public Affairs, the community’s main public policy umbrella group, will consider a draft resolution on fracking that in its current form acknowledges the potential benefits of a major new source of natural gas while urging greater oversight and government regulation of the practice. “Our goal is to see energy independence that protects the environment,” said Sybil Sanchez, executive director of the Coalition on the Environment and Jewish Life, or COEJL, an initiative of the JCPA that promotes environmental stewardship. Fracking refers to the process of pumping water, sand and chemicals into rock deep below the surface of the earth in an effort to release trapped deposits of natural gas. The controversial technique, which critics allege poisons groundwater and creates significant public health problems near drilling sites, has grown into a major policy debate. In Pennsylvania, thousands of wells already have been dug to tap gas from the Marcellus Shale Deposit, a vast subterranean rock formation that is believed to hold enough natural gas to supply American demand for decades. New York, which also sits atop the Marcellus, has a moratorium in place on fracking, but Gov. Andrew Cuomo is considering lifting the ban. At least four Jewish summer camps in northern Pennsylvania have signed leases to permit fracking on their land, the Forward reported last summer. In the Jewish community, the fracking debate pits two established communal policy objectives against one another: protection of the environment vs. the desire to achieve independence from foreign energy sources, particularly from the Arab Middle East. Energy independence is among the major policy objectives of the American Jewish Committee, whose New York chapter will host a panel discussion on Feb. 6 with three speakers who either endorse fracking or accept its inevitability. Richard Foltin, AJC’s director of national and legislative affairs, told JTA that his organization believes that natural gas can be safely extracted from shale. Some environmental activists are deeply skeptical of both those claims. The environmental safety of fracking has yet to be conclusively demonstrated, they say, and the industry has a poor track record. Moreover, even if the environmental concerns were addressed, the effects on foreign oil imports are likely to be negligible in the short term. Even so, fracking is virtually certain not just to continue but to expand. Thousands of wells already have been drilled, vast economic interests incentives are at play and the natural gas would be a cleaner-burning replacement for coal, the main U.S. source of energy. Consequently, some in the environmental world have adopted a harm-minimization strategy rather than pushing for an outright ban. The JCPA resolution, which was proposed by the Jewish Labor Committee, the Jewish Reconstructionist Federation and the community relations councils of Pittsburgh and Silicon Valley in California, urges legislation that eliminates the gas industry’s exemption from the Safe Drinking Water Act and requires full disclosure of the chemicals used in fracking. For some, though, no regulatory regime will ever be sufficient.